Amy’s 85-year-old mother, Margaret, was always complaining of being cold. She kept turning her thermostat up even when others were too warm. Amy wondered if there might be something wrong, so she talked to Margaret’s doctor. She was surprised to learn that there are several reasons that older adults feel cold when everyone around them is warm. Below are 5 reasons that seniors feel cold. As people get older, their circulation changes. The walls of their blood vessels get stiffer, causing a decrease in circulation. In addition, the layer of fat beneath the skin that helps hold in body heat gets thinner. The body’s response to cold also changes with age. Blood vessels that are supposed to constrict to keep the body warmer may not react as fast to cold as they used to. Anemia is a condition that occurs when there aren’t enough red blood cells to deliver oxygen to tissues. About 10 percent of people over the age of 65 have anemia, but the condition is often overlooked, so they may be undiagnosed. Being anemic can make hands and feet feel cold. It also causes other symptoms, such as skin that has a yellowish tint, headaches, feeling short of breath, and an irregular heartbeat. The side effects of some medications can make older adults feel cold. Beta blockers used to treat heart disease are one such drug. Their purpose is to make the heart relax, but they can also cause cold hands and feet, dizziness, nausea, and fatigue. Talk to the doctor about whether any of the medications your aging relative is on have coldness as a side effect. Diabetes can affect circulation and cause anemia. It also commonly causes peripheral neuropathy, which may give the person a sensation of having cold feet even when their feet feel warm to the touch. When a person has kidney disease, their kidneys aren’t able to remove waste products from the body as efficiently as they should. A build-up of waste can cause a drop in core body temperature. In addition, kidney disease can also cause anemia. If your aging relative often feels cold, an elderly care provider can help them to be more comfortable. Elderly care providers can bring the older adult a sweater, blanket, or their slippers. An elderly care provider can also make the senior a warm drink. 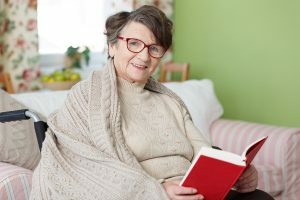 If a medical condition is the cause of the senior feeling cold, an elderly care provider can help them to better manage the condition by reminding them to take medications. IF YOU OR AN AGING LOVED-ONE ARE CONSIDERING ELDERLY CARE IN RALEIGH, NC, PLEASE CONTACT THE CARING STAFF AT SENIORS HELPING SENIORS TODAY. CALL (919) 761-5346. North Carolina Alzheimer’s State Advocacy Day 2019 A Success Does Napping Lower Blood Pressure?